Collar - is a tool which no breeder can do without. 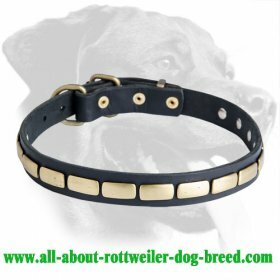 Our online store is proud to offer you the highest quality Rottweiler dog collars. How to choose an appropriate collar for your dog. Special parameters and photos will help you to make such a difficult choice. To be the best one depends on how comfortable will feel your beloved pet during a walk. 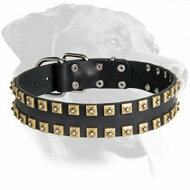 All dog collars presented in the store have been certified and are safe for the Rottweilers's health. 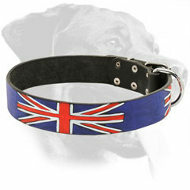 We offer dog collars of all colors and models. 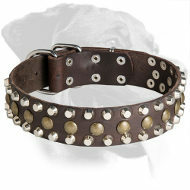 Every dog should have a collar, but it's not as easy to choose as it might seem at first glance. There are many types of special dog supplies made not only for some specific dog breed, but also for certain occasions and different types of training. And it is rather hard to sort out in a huge variety of collars offered by modern zoo-industry. We will help you make the right choice and dress up your favorite four-legged friend with a supply suitable for him. Types of collars are primarily divided according to the purpose of use: Soft classic collars (walking, with a handle for guard/service dogs). These collars are made of leather, synthetic material or a combination of two. Typically, these collars have a soft padding (felt, fleece, thin skin with soft extender) to ensure maximum comfort for your dog. Walking collars – are the most common type. They usually have one D-ring for attaching a leash. 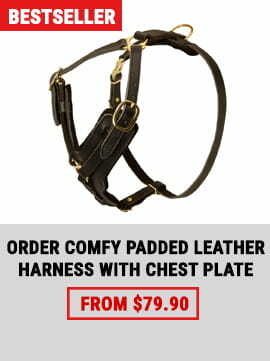 It may be attached near a buckle, what does restrict an animal to move his head freely. 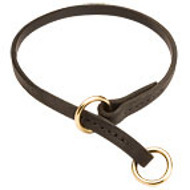 Or on the opposite side of the collar - in this case the owner does not need to look up the ring to fasten the dog (buckle, usually turns down because of its weight). Protection training dog collar is equipped with a convenient handle so you can hold back the dog. A ring for a leash is placed either on a handle or just below it. Usually there is one D-ring near the buckle, and while working on leash it is better to attach a leash to it. 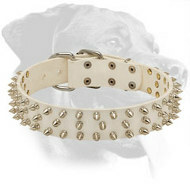 Guard dog collar - is the most reliable, time-tested type. It is intended to walk the dog on a leash all the time, therefore, it should have improved durability. The main feature of it is that the collar strap is passed through a D-ring, and only then is fastened with a help of a buckle. Thus, the force (in case of pulling) is distributed not along the buckle and holes for fastening, but along a dense material which is passed through the ring. A buckle is also located at the top and does not interfere with the dog. 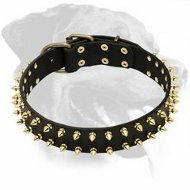 Choke dog collar (chain, leather, nylon). These collars are mostly used as a training tool or for dog shows. However, quite a light weight makes them easy to use in everyday life. The chocking effect of such collars is perceived by dogs as the closest one to the natural conditions of upbringing in a pack: a dog-mother teaches her puppy by chocking his neck. However, any such impact on a dog, especially a puppy, should be precise and short; otherwise, it'll lose all educational value. 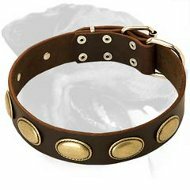 Experienced trainers, before allowing the beginner to use this type of collar should describe in details and show how it should be done and how it should influence the dog properly. Metal or choke chain collars should be made of durable alloy, all parts must be soldered or welded, and the covering should be made in such a way so as not to hurt the dog. At present, many Rottweilers suffer from allergy to nickel alloys. Therefore, we’ve developed a special alloy based on copper - curogan, that is slightly darker and redder than brass, but does not cause allergies in dogs. It must be noted that some not very good chains may stain light-colored dogs. So, before going to the show, it is better to test the product you use. One more remark: short-haired dogs or dogs with long fluffy hair are shown with almost jewelry chains on. It is made so as not to divide the dog's neck visually, and not to flatten the fur. But the more the link, the less the chain cuts the dog's coat. Therefore, the owners of the Shepherd dogs use chain collars with long (2 inches) links. Pinch collar. This type should be considered as a special one and to be used under the supervision of experienced trainers. 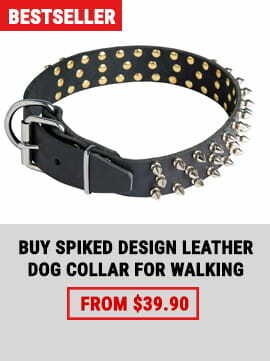 The main feature - is the presence of spikes, which when the dog pulls make him feel discomfort. This collar is chosen only according to the circumference of the dog's neck, it should be worn just right behind the ears, not to hang loose and not to fall off the dog. One of the best known manufacturers of quality metal collars is a German Herm Sprenger company. 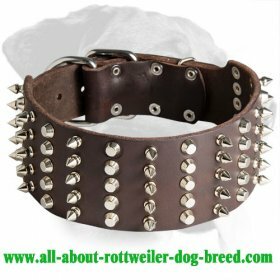 The range of products includes several types of pinch collars - wire and plated, with long spikes for long- or short-haired dogs made of various metals and with different covering. The latest development of this company are pinch collars the spikes of which are directed in two ways from the central plate near the Adam's apple of a dog. Such an arrangement, according to experts, creates a natural pressure on the dog's neck, simulating a bite of mother. The dog shouldn't wear a pinch collar all the time. It can only be used during training and only when all other means to achieve obedient behavior were already tried. Permanent use of pinch collars by inexperienced dog owners with puppies of 5 months age, can be detrimental for general obedience and ability to control an animal. Show collar must not distract attention from a dog (usually is selected according to the color of the dog's hair). It is important the collar not to divided the animal's neck visually, to be comfortable, reliable and practical. In most cases this is either a synthetic show collar (made of a thin cord) or chain choke collar. However, there are several breeds which require long running of a dog around the ring. In this case, a dog has to run ahead of the handler with his head held high. In such cases, experts use metal or leather show collar with special shape in the area of dog's Adam's apple. 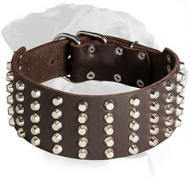 The collar in this area can be either metal or leather, with spikes (if the dog pulls strongly) or not. A collar can be found for any breed. However, you must take into account the peculiarities of an anatomical structure of the respiratory tract of some dogs. For example, pugs and other breeds with short snout have very sensitive neck and can choke, so they are recommended to walk on a harness. For graceful dogs (like Greyhounds) it is better to use collars wide in the front part of the neck. But in any case, the collar should be as durable as possible so as not to outwear very fast. Which material is the most durable? 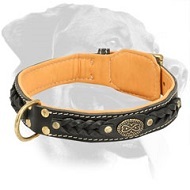 Collars are made of durable leather, nylon strap or cord, metal, as well as their combination. Leather - is the most pleasant material both for a man and an animal. Quality thick leather will be always fashionable and beautiful, and will serve you for long. However, like any other leather product, a collar will require careful treatment and special service. Nylon can be considered as the most durable of materials for the production of soft collars. Resistance to various weather conditions make them indispensable in everyday life. Moreover, color, width, and model can be chosen according to the owner’s taste. 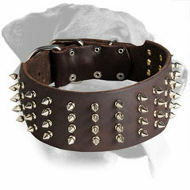 The most durable and reliable can be considered a soft collar made of a combination of leather with a synthetic strap. Quality production and reliable fittings, this combination will be a win-win both for a guard collar and for protection training of large dogs. 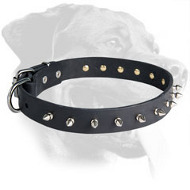 It is clear that quality metal collars can serve more than for one "dog's" generation. However, using a metal collar in a cold season is not recommended, because of a risk of frostbite. You can make a collar for your pet yourself. But you must remember that its reliability is often dependent not only on the safety of others around but on your pet as well. Therefore, you should take into account the size and strength of your Rottweiler and the selection of materials and accessories so that their ultimate strength to be at least 5 times higher than the weight of your pet. The main thing is that the collar should fit right. Soft collar should be chosen so that being fastened on the middle hole (usually there are two more holes for smaller and larger size) it does not hang loose on the dog's neck. Usually there should be enough space to put a thumb under the strap: otherwise, if it is smaller - the collar may choke your dog, if bigger - it may fall off or rotate around the dog's neck. If you select a collar for a Rottweiler puppy, you should keep in mind that the dog is growing. So, the size of a collar should be adjustable. You should be able to increase its size and the tip of a strap should be not very long so as not to interfere with the comfort. So, now (when your dog is still a puppy) the collar should be fastened to an extreme inner hole. While you puppy is growing you as an owner will be able to fasten the collar according to the size of you Rottweiler's neck. In is not recommended to wear a collar 24h a day, since they can rub the dog's hair and discomfort him. 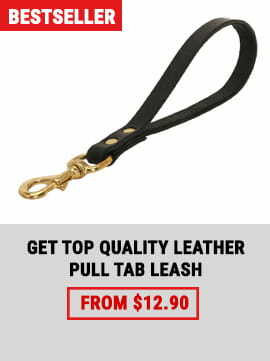 If you need to hold your Rottweiler at home, for this purpose, it is better to use a thin leather choke collar. 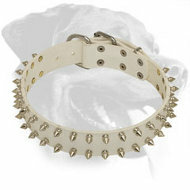 Remember, a dog collar - is not just an accessory, it is a modest "outerwear". A dog wears it almost around the clock. Therefore, the collar should be of a high quality, comfortable and safe.